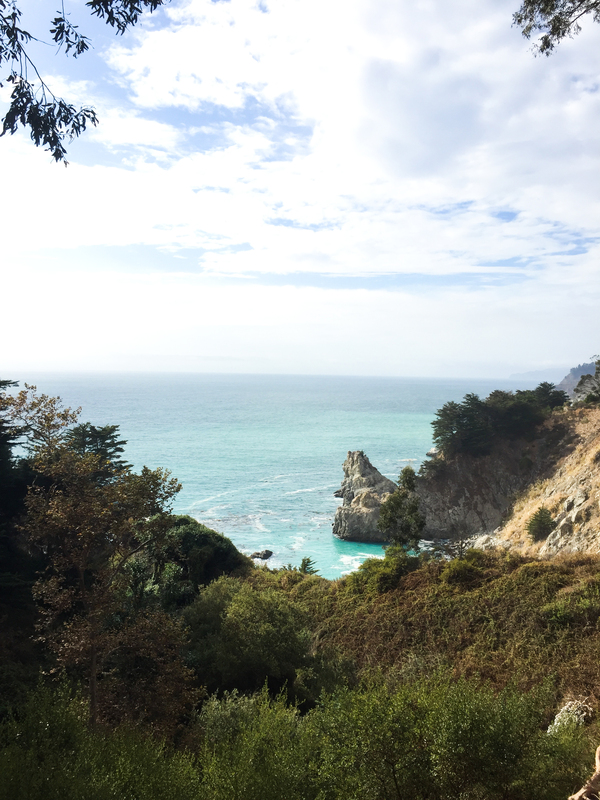 Aside from the sketchy driving and remarkably treacherous cliff-edge roads that could give the calmest of humans an anxiety attack, driving through Big Sur is inarguably the most beautiful way to get to San Francisco. 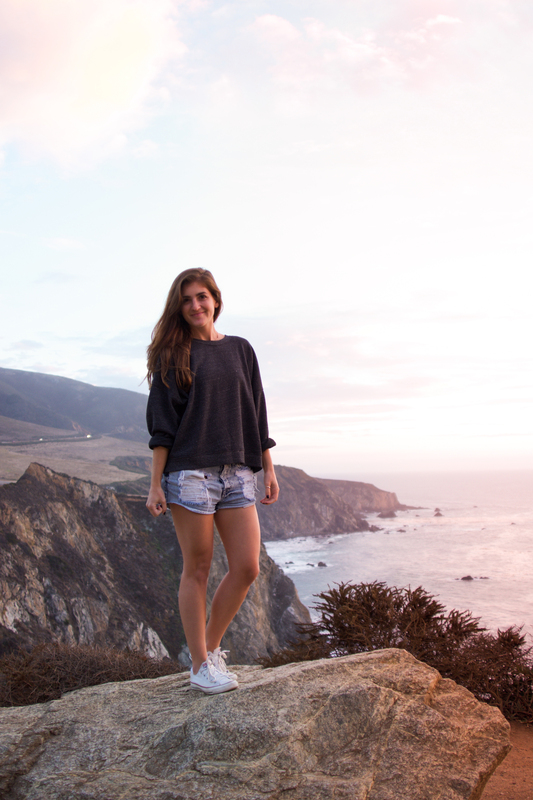 Also, just a side note, Big Sur > Big Bear. That is all. 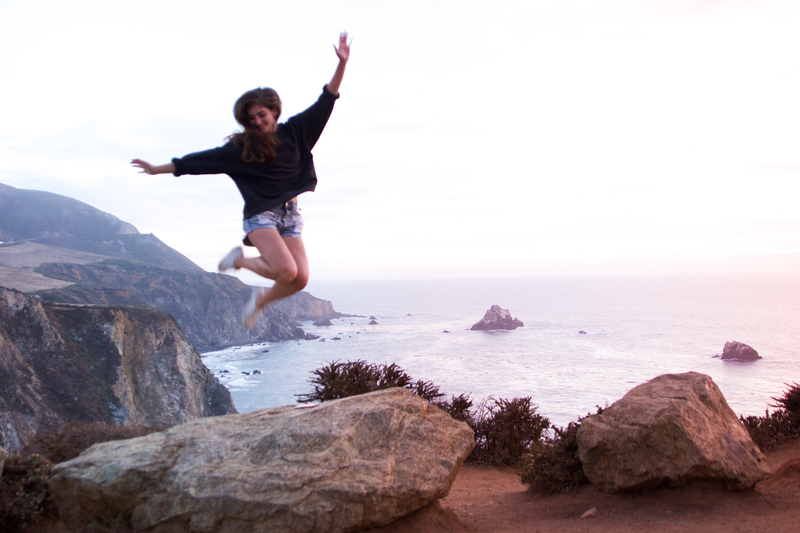 On our trip to #werunsf, we decided to take the long way and spend the afternoon in this magical place. As I’m sure you know, this relatively remote locale boasts some of the most strikingly beautiful scenery one can encounter. 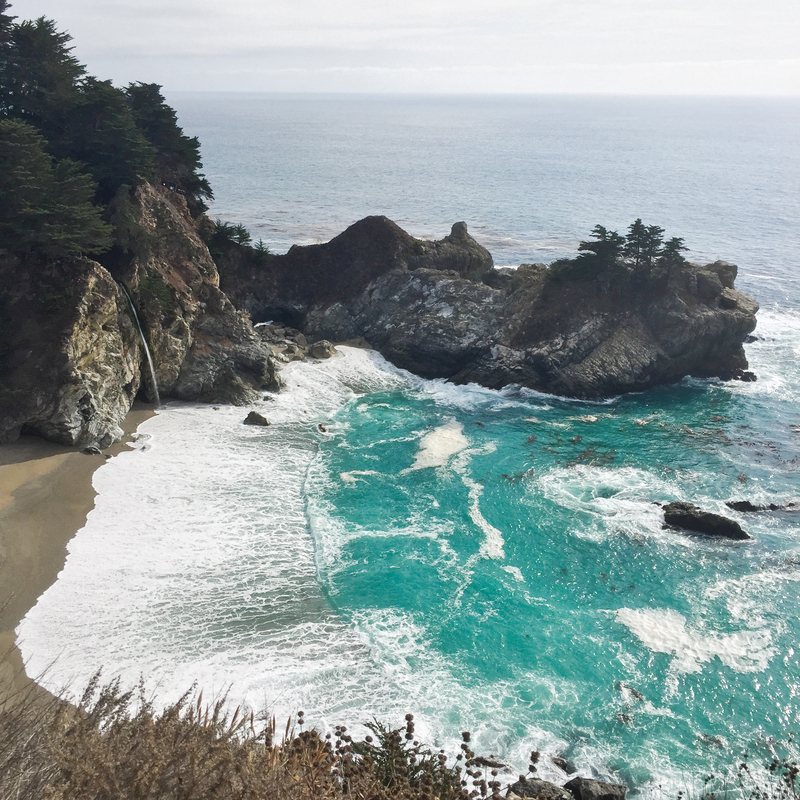 As a person who loves nature, the sea, and California’s coastline, I was more than thrilled to visit this place for my very first (!) time. And I also just want everyone to know that I did a really great job driving. 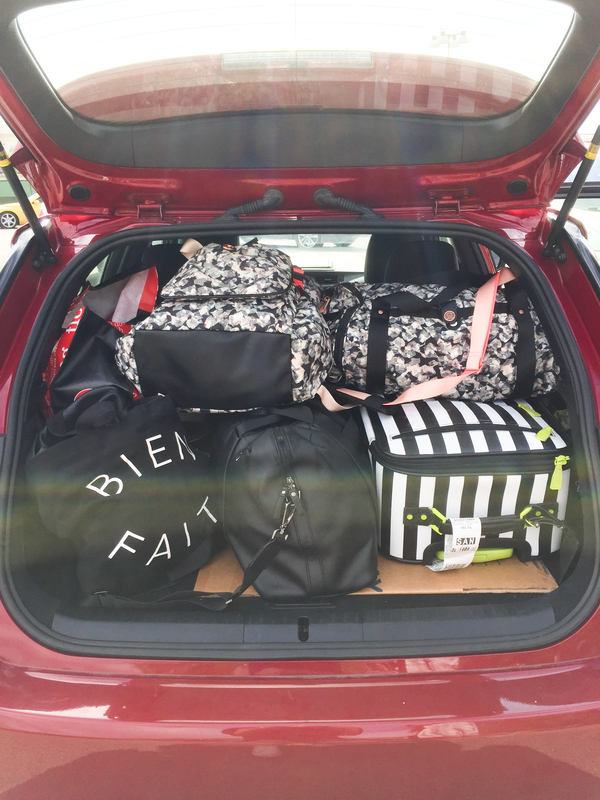 Here’s a little road-trip round-up: a few dos and don’ts, and my my uber casual but v comfortable road trip essentials. Most of this trip took place to the soundtrack of Taylor Swift (not embarrassed in the slightest) and Scavenger Hunt’s Lost. I recommend playing that song while reading this post to achieve an optimum reader experience. Go turn on your Spotify (here’s a youtube link just in case); I’ll wait a second. 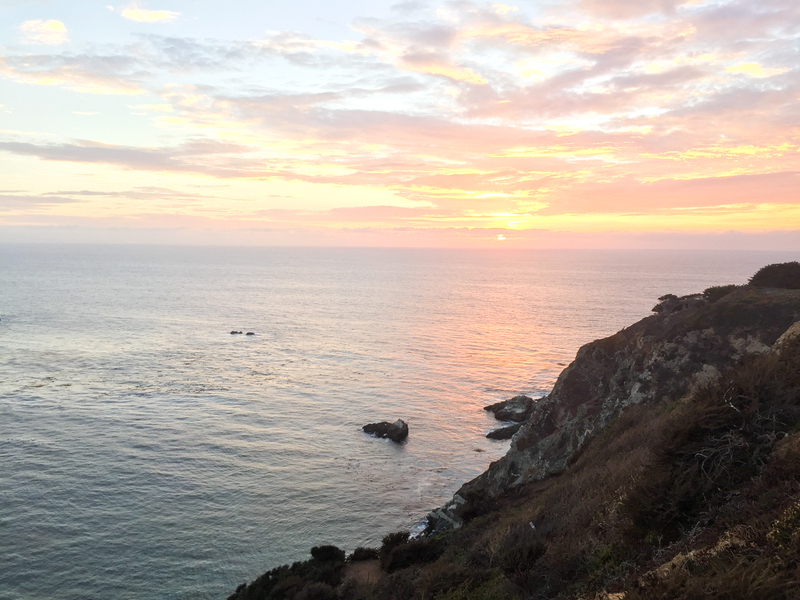 The earlier you leave, the more you’ll avoid traffic, and the more time you’ll have to explore before it gets dark. I’m writing from the perspective of driving from Southern California, so tailor this advice based on your location. 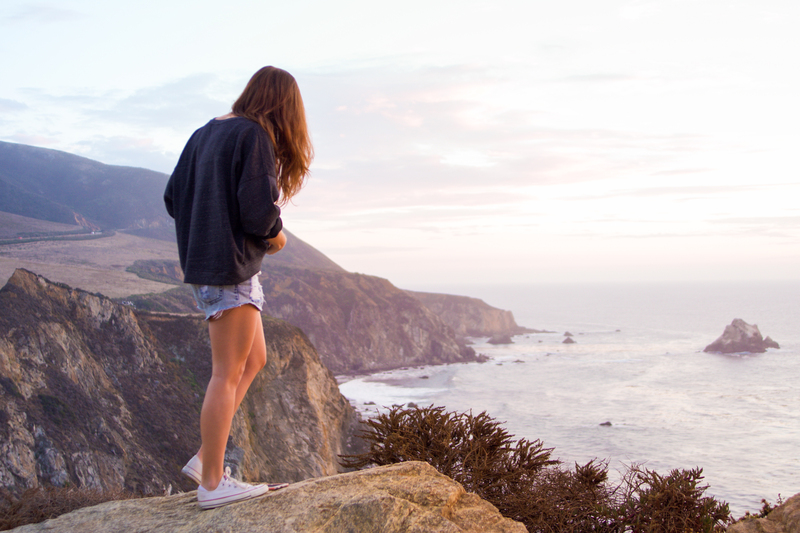 This is obviously not a hard and fast rule, as there’s no law against driving through Big Sur at night, I would just highly advise against it, unless you’re trying to exercise your adrenal glands and see what they’re made of. The winding turns at the edge of sheer cliffs are challenging enough in the daytime, regardless of your skill as a driver. Also heads up, if you’re going pretty slow and you’ve got a few people behind you, don’t feel pressured to speed up – just pull over when you can and let cars pass you. 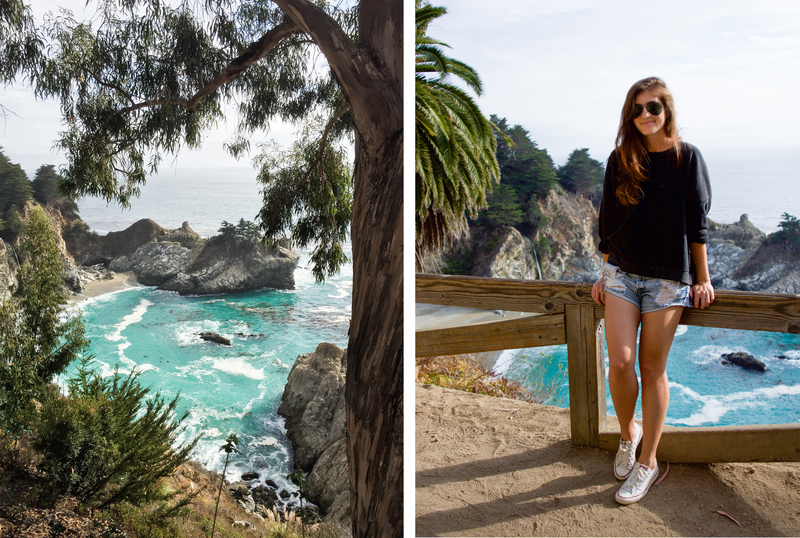 Our first stop was at McWay Falls, which I formerly knew as “the instagram spot.” Prior to visiting, the most I had seen of Big Sur was the classic shot of McWay falls + the Valencia filter or something from VSCO. This place is hands down one of the most beautiful sights I’ve ever witnessed. The pictures barely do it justice. Here’s a spot on the map so you can navigate. Parking is just in the dirt on the side of the road, but there was plenty when we arrived. Unless you want to pay $5.59/gallon for REGULAR. Fill up before you get into this area. Take heed, dear readers. We stopped here after McWay Falls. Because this place is incredibly overpriced, we split the special: diver scallops with brussels sprouts, sauteed chanterelles, and fingerling potatoes. It came with a salad (big enough to split) and fresh baked bread (total was around $45 with tax, before tip). This particular plate was delicious, although I’ve read/heard that Nepenthe can be a bit of a tourist trap with less-than-stellar food and staggeringly high prices. We had a great experience, with stunning views. Drinks aren’t super expensive, you could stop and grab a glass of rosé, check out the views, relax, and then keep going (for $10). 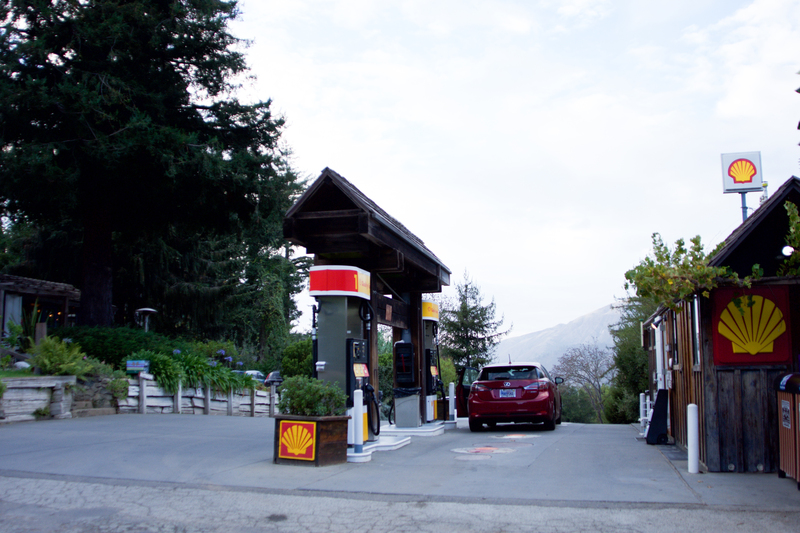 We’ve also been told that the River Inn and Big Sur Bakery are great places to stop for a little bit less dinero. I’ll definitely be trying these on our next stop, but for now, I’m v pleased with the scallops and the majestic views of the Pacific. We all know I did. But seriously, take a ton, because this is the most photogenic landscape. Take advantage. Desktop backgrounds for dayyyyzzzzz. 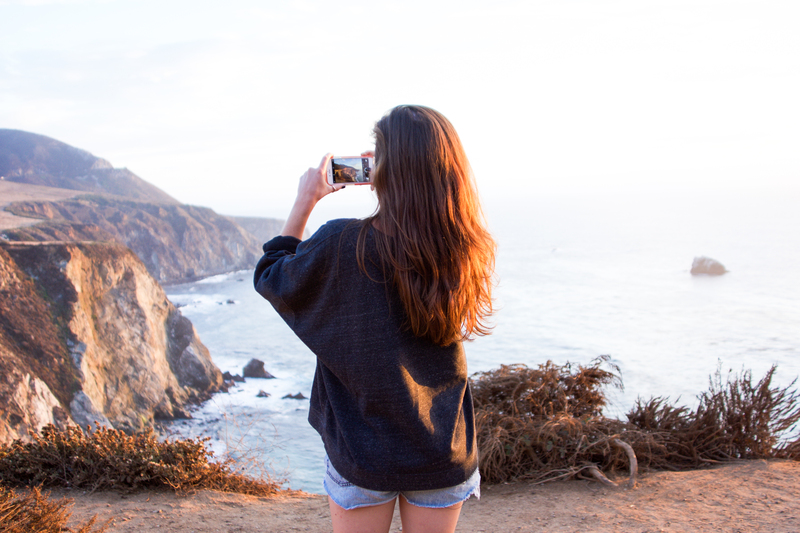 Also if you’re like me and you feel like being annoying on snapchat (see above), take all the snaps you want while you’re there (let them fail – there’s no service and they won’t send right away), and then wait to have service or wifi. All of them will send at once and your friends will be SO EXCITED you finally have service to bombard them with a 300s snap story!! My friends tell me all the time how much they love it jk they all hate me. We got here just as the sun was setting, and it was pure magic. I know I use that word a lot, but it feels most accurate here in this moment. 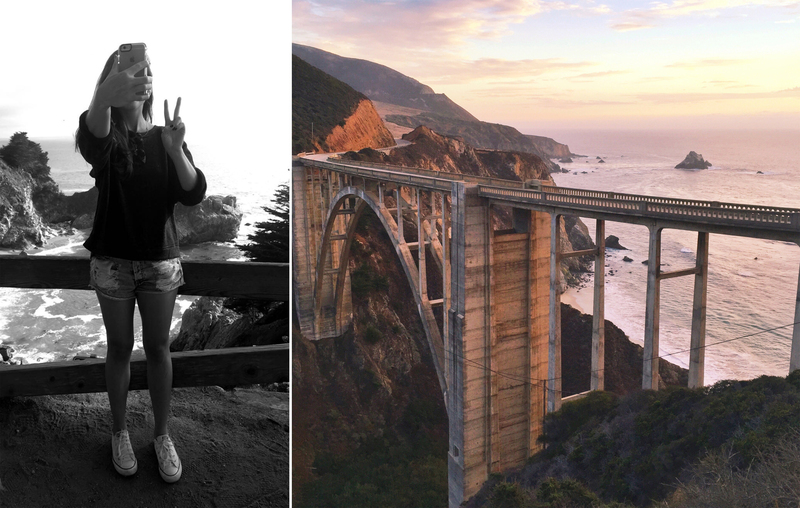 The most beautiful, glowing pink sunset, overlooking the rugged coastline, set in front of a 1930s bridge/iconic California landmark. 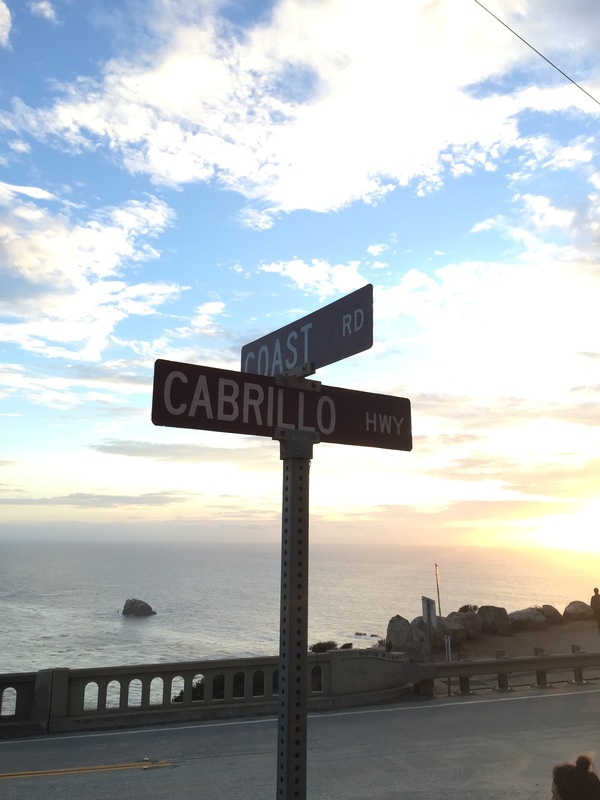 If you’re driving from the south, heading up to SF, cross over the bridge and turn right onto “coast road” (see below, also the panoramic shot two images up). Also make sure you check the weather. It was super warm when we got there, but still cool enough to need this light sweatshirt. Crewneck: J. Crew Brushed Fleece Sweatshirt (it’s on sale, I got it when they were doing +40% off sale, so it was basically free. Right now I think with the discount it’s somewhere around $22). It’s boxy, but it’s cropped. I’m wearing an XL. Wore it multiple times throughout the trip. Cami: for underneath. I didn’t wear one, but you might want to layer. 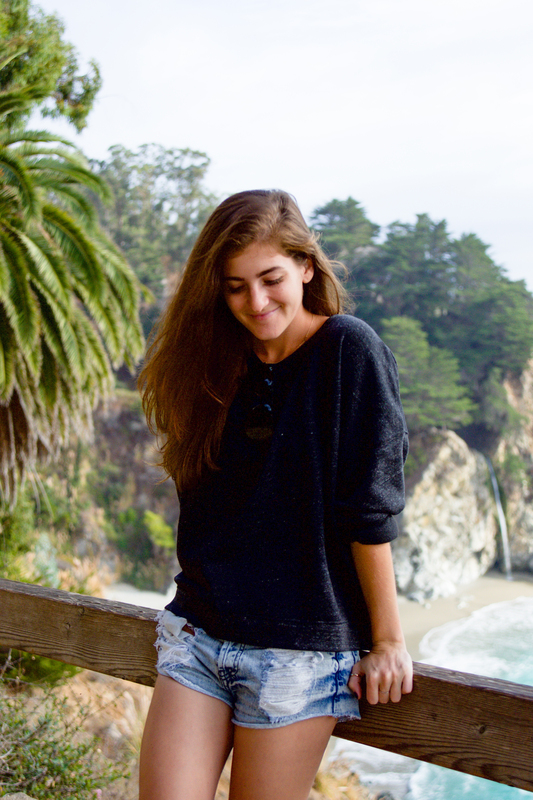 Cutoffs: (similar here) don’t distressed denim shorts just scream “roadtrip in California”? No? That’s just me? 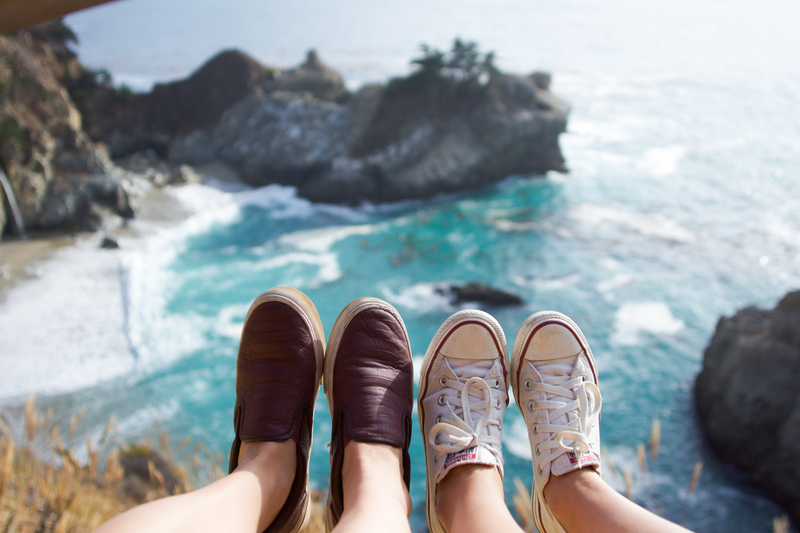 ok.
Converse: another roadtrip-esque, casual-cool staple. Aviators (really throwing off my alliteration and that upsets me): are you a pilot? 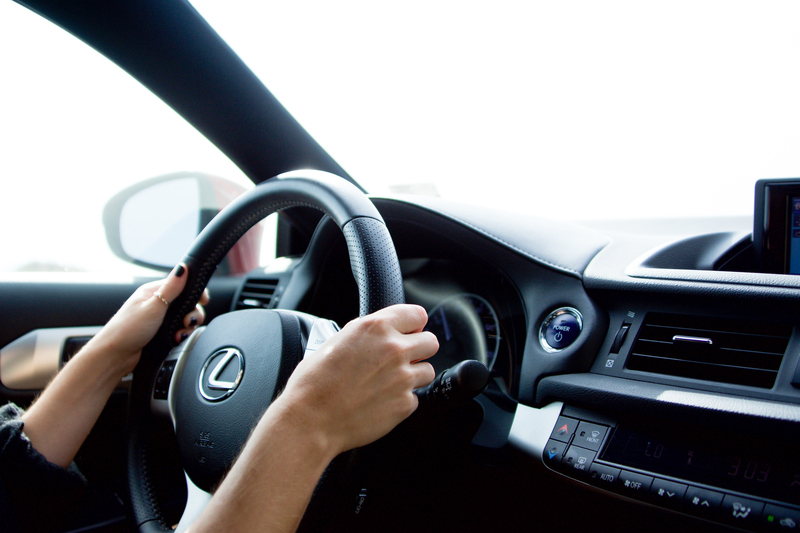 or a really great driver on the windy roads of the central coast? the world may never know when you wear these sunnies. Last tip: map it out in advance, because there’s no cell service for the majority of this drive, and it’s probably a good idea to have a backup map. Granted, all of these things are on the same road, and there are signs everywhere, but I always suggest over-preparation. It’s the A-type in me. That’s basically it. 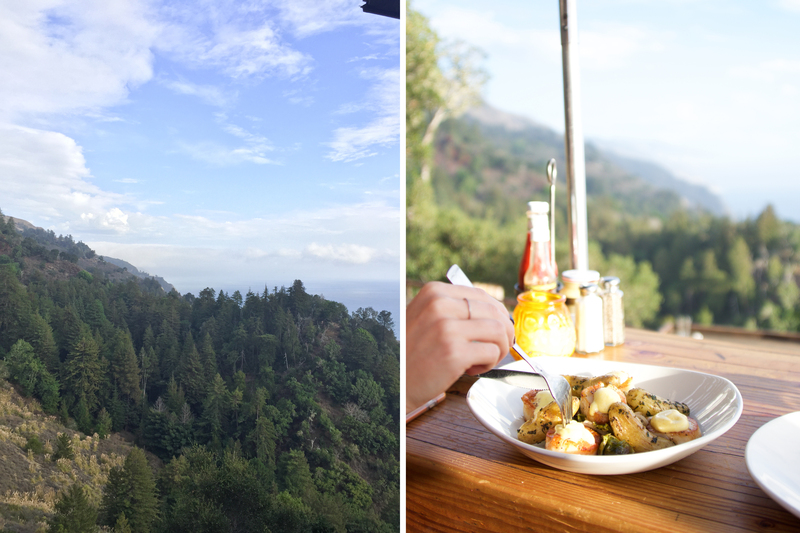 We breezed through Big Sur in just a handful of hours, and I’m already pining (get it… pining… lol) for another trip back. Ideally a more extended stay, perhaps in a cabin? Camping? This place has so much to offer, and this quick little road trip guide hardly scratches the surface, but it’s exactly what we were able to fit in on our trip north. Consider it an incredibly realistic afternoon of activities/a super beautiful pit-stop guide. Have fun on your road trip! Stunning photos!! 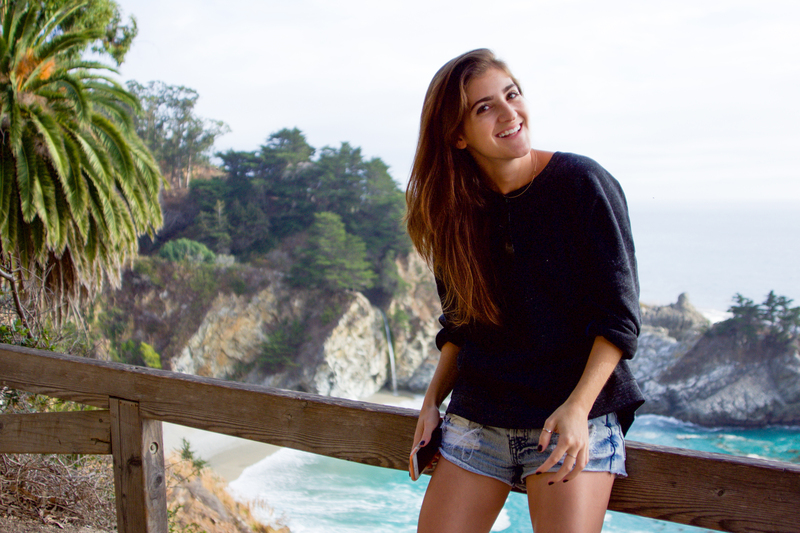 Big Sur is amazing!! a whirlwind 8 days with some of the best people I’ve ever worked with. thank you times infinity to the @waltdisneyworld and @disneycruiseline teams for creating quite literally the most magical press trip of my life. miss you already!! . I need to sleep for 8 days now but first, off to @hailess and @jcgafa’s wedding shower!! ps you guys I’m gonna take you to wdw as your wedding gift get excited jordannnn! I interrupt this previously scheduled disney vacation content with an important announcement: BAND OF SHADOWS AKA #bandofshadows AKA THE BRAINCHILD OF MAGNIFICENT AUTHOR @hailess IS NOW AVAILABLE ON AMAZON BUCKLE UP YALL IT IS A WILD RIDE. I love you Hailey and I’m so damn proud of all the years of work that you’ve put into this masterpiece. ok everyone proceed to your purchase and back to you in the magic kingdom! !